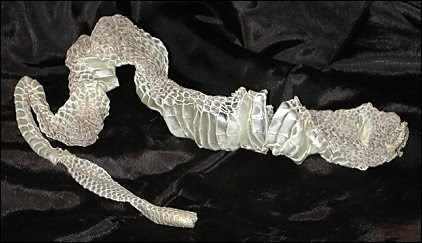 Yes, this post is about snakes, and that is a snakeskin above, inside out after being shed by a rattlesnake. NPR recently aired an interview with herpetologist Terry Phillip of Reptile Gardens in Rapid City, South Dakota (LISTEN HERE), who has observed a growing number of prairie rattlesnakes (Crotalus viridis) that have lost their ability to rattle. The snakes with atrophied tail muscles are unable to signal their presence and therefore avoid being killed by humans and their natural predators, surviving to pass on that genetic defect to the next generation. Other biologists believe the lack of a rattle to shake may in fact be an evolutionary development to avoid detection. But even if you do spot a venomous snake and cut its head off, it may retain some postmortem abilities, so watch out for that business end!